Cyprus plans to launch a state investment fund to raise billions of euros required to qualify for a 10bn-euro (£8.5bn) international bailout. The new package of measures is still under discussion to reach a target of 5.8bn euros demanded by the EU and IMF, and may include a revised bank levy. The European Central Bank (ECB) warns it could halt special funding for ailing Cypriot banks on Monday. Cyprus' central bank has denied that Cyprus Popular Bank is to be shut down. Correspondents say the new plan may include nationalising pension funds of semi-public companies and limiting the bank levy to deposits above 100,000 euros. Political leaders discussed the options with President Nicos Anastasiades on Thursday, and the package is expected to be studied by the government shortly. But it is not clear when a parliamentary vote on it will be held. 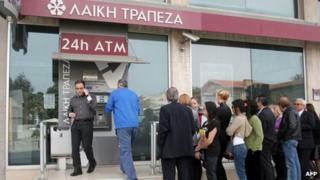 Cyprus' banks, which have been shut all week to prevent mass withdrawals, are to stay closed until next Tuesday. State broadcaster CyBC said employees of Cyprus Popular Bank, the country's second largest, were told on Thursday afternoon the bank would be closing down. But central bank spokeswoman Aliki Stylianou said: "We deny these reports. Efforts are under way right now to find the best possible solution for this bank." Anxious Cypriots did not want to take any chances, queuing outside Popular Bank - otherwise known by the Greek name Laiki - cash machines in the capital Nicosia. "There are rumours that Laiki Bank will never open again. I want to take out as much as I can," retired government official Phaedon Vassiliades told the AFP news agency. Meanwhile the island's largest bank, the Bank of Cyprus, appealed for a bailout deal to save the economy from ruin. "The Cyprus economy is on the brink and in a fragile state. The next move may prove its salvation or destruction," it said in a statement. Cyprus is required to find 7bn euros (£6bn; $9bn) in total to get the 10bn-euro EU-IMF loan. Cypriot officials say a state "investment solidarity fund" would issue bonds to raise 5.8bn euros. The other 1.2bn would most likely come from privatisations and by increasing capital gains tax and the corporate tax rate. Cypriots are finding it increasingly difficult to perform everyday financial transactions as cash and credit dries up. The banks are still giving out cash through machines - although with limits, and some are running low. Some businesses are now refusing credit card payments. "We didn't discuss a [deposit] haircut and we are not reverting to it," Cypriot parliament speaker Yiannakis Omirou told reporters, in remarks quoted by Reuters. But one senior government MP, who did not want to be named because he said discussions were not over, said the bank levy would remain in some form, the BBC's Chris Morris reports from Nicosia. Without it, the MP said, Cyprus could not raise all the money it needed. The previous proposals had included a levy on deposits between 20,000 and 100,000 euros, which had outraged many Cypriots. There has been much speculation that the new Cypriot plan could include Russian help, as Russia has multi-billion dollar investments in Cyprus. Russians, including wealthy tycoons, hold between a third and half of all Cypriot bank deposits. Russian Prime Minister Dmitry Medvedev has poured scorn on the eurozone's bailout plan for Cyprus, accusing EU leaders of behaving "like a bull in a china shop". The Cypriot Finance Minister Michalis Sarris has been in Moscow for a second day to negotiate assistance. The country's two biggest banks, Bank of Cyprus and Laiki, are believed to be reliant on the ECB's Emergency Liquidity Assistance, provided via the Central Bank of Cyprus. The ECB's governing council can halt ELA if it believes the banks receiving it are no longer solvent, the Financial Times newspaper reports. The banking sector dominates Cyprus' economy and if a viable rescue is not organised soon the island state risks having to abandon the euro.